This late seventeenth-century cottage (shown above) is on the west side of St Cross Road (originally called Church Street), on the southern corner of Jowett Walk. It has been owned by Merton College since at least the early twentieth century and is Grade II listed (1047129). It is sometimes numbered 3 St Cross Road. James Florey, a college servant, was living here at Holywell Cottage by 1861, and from 1889 he and his wife ran a lodging house here. He died in 1895 and was buried in Holywell Cemetery. His wife remained at Holywell Cottage, continuing to run the lodging house until 1903. In the twentieth century various academics lived at Holywell Cottage. The last was John Jones, Professor of Poetry at Oxford from 1978 to 1983, who was asked by Merton College to vacate the house. Occupants of Holywell Cottage listed in directories etc. Kenneth King Leys Munsie, M.A. Henry John Franklin Jones, M.A. Hard to identify in the censuses, which list all of St Cross Road as “near the Church”. James Florey (62), a gardener, lived here with his wife Ann (60) and their daughter Mary (27), who was a milliner. James Florey (70), now described as a college gardener, lived here with his wife Ann (70) and their daughter Anne (33). Another college servant boarded with them. John Lyttleton Etty (35), an unmarried schoolmaster, lived here alone with one servant. 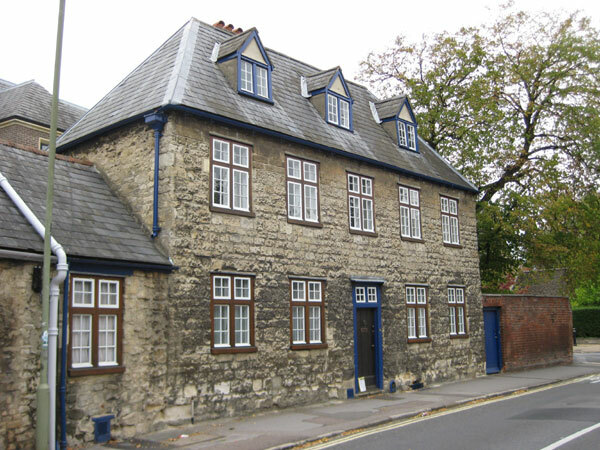 Holywell Lodge was the first of a group of cottages or tenements situated approximately opposite Holywell Cemetery and owned by Merton College. The Revd Vaughan Thomas, who was Vicar of Yarnton from 1803, lived at Holywell Lodge, and is listed there in Pigot's Directory for 1830 (with the house wrongly but typically described as Holywell Cottage). He had married his first wife Charlotte Williams at St Mary the Virgin Church on 12 October 1811: she was the niece of the Revd Dr John Cooke, formerly President of Corpus Christi College, and the sister of Dr George Williams, the former Professor of Botany. On 31 July 1843 she died at Holywell Lodge, and by mid-1845 the Revd Vaughan Thomas moved to Magdalen Gate House (marrying his second wife Catherine by 1851). TO be LET, at Midsummer Day next,—A large and convenient HOUSE, near Holywell Church, known by the name of HOLYWELL LODGE; consisting of five rooms on the ground floor and five rooms on the second floor, attics and cellaring, water closet and pump in the house, with every other convenience, and a large walled-in garden attached, with or without a close, stabling, &c. adjoining.—For particulars inquire of Mrs. Weston, near Holywell Church, Oxford. The next tenant of Holywell Lodge was the Revd Edward Meyrick Goulburn, then Vicar of Holywell. In his Reminiscences of Oxford, William Tuckwell writes how in the early 1840s Goulburn“brought his bride to the pretty little Holywell Cottage [i.e. Holywell Lodge], now swept away”. The Revd Robert Gandell was the next tenant of Holywell Lodge, together with his wife Louisa Caroline Gandell, and their daughter Florence was born there on 2 August 1851. On 5 May 1855 Merton College leased Holywell Lodge with its adjoining meadow and pasture to Gandell. Seven more children were born to the Revd Gandell and his wife Louisa at Holywell Lodge: Thomas Pearse Gandell (1853), Beauchamp Macbride Gandell (1854), Mary Kerr Gandell (1857, died the following year), Schomberg Frederick Gandell (1859), Sidney Graham Kerr Gandell (1861), Shirley Mark Kerr Gandell (1866), and William Raleigh Kerr Gandell (1870). On 30 September 1871 Mrs Gandell advertised for a gentleman's son aged between six and eight to be educated alongside her second youngest son this house. Gandell was appointed Laudian Professor of Arabic in 1861. Gandell's first wife Louisa Caroline died at Weston-super-Mare, Somerset at the age of 53 within weeks of her husband's appointment as Canon of Wells Cathedral and was buried in Holywell Cemetery on 17 July 1880. On 14 June 1883 he married his second wife, the widow Mrs Mary Anne Platt, at St Cross Church, but the marriage only lasted four years, as Gandell himself died on 24 October 1887 and was buried in Holywell Cemetery. A forthcoming auction of all his furniture was advertised in Jackson's Oxford Journal of 19 November 1887. The next occupant of Holywell Lodge was Charles Edward Bickmore, Fellow of New College, who was summoned for allowing his chimney to be on fire there on 12 February 1889. His son Sidney Beaumont Bickmore was born there on 11 April 1890. In 1891 Merton College sold the row of tenements that included Holywell Lodge (together with just under five acres of land to their rear) to Balliol College: the sale included the agreement that the tenements themselves were to be demolished in order to allow for the widening of Church [St Cross] Road. Occupants of Holywell Lodge listed in directories etc. The Revd Vaughan Thomas (60) was living at Holywell Lodge with his first wife Charlotte (50) and one male and two female servants. Robert Gandell (43), described as a clergyman without cure of souls, was living at Holywell Lodge with his first wife Louisa (34) and their children Florence (9), Thomas (7), Beauchamp (6), and Schomberg (2). A governess and four servants lived with them (a cook, nurse, under-nurse, and housemaid). Louisa Gandell (44) was at home in her husband's house with her three youngest sons Sidney (9), Shirley (4), and William (eight months), plus a French governess and seven servants, including a footman. [Sidney] Graham Gandell (19) was home alone in his parents' house with four servants.